June 20, 2016 April 1, 2019 - The 'Noms. 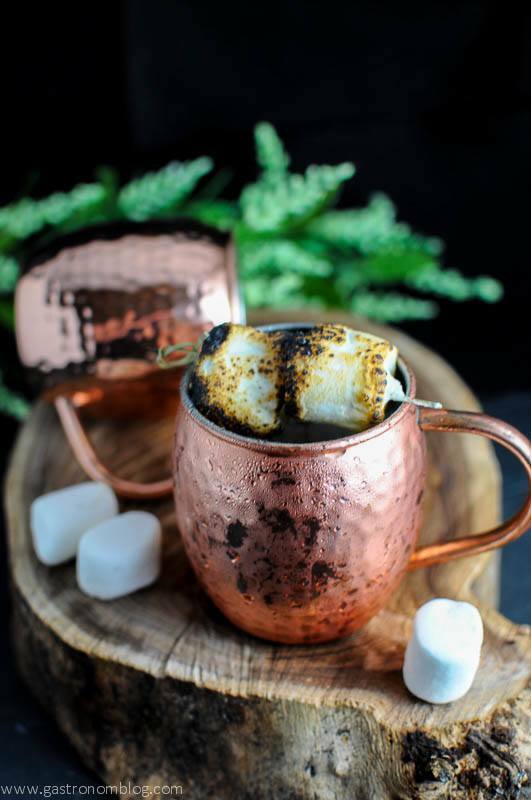 A campfire Mule topped with toasted marshmallows! We recently spent a week up in Estes Park, Colorado enjoying a family vacation and Save 10% when you use your AAA car rental discount code on all Dollar car rentals . We enjoyed being in the beautiful Colorado Rocky Mountains and getting a chance to explore Rocky Mountain National Park. Then we spent many hours during the day hiking around the national park. In the evenings we returned to our cabin and spent those hours checking out some of Estes Park‘s offerings. Imagine our excitement when we found a local distillery’s tasting room just down the block from our cabin, where we found a spirit that inspired today’s cocktail, the Campfire Mule! We stopped in to see the the folks at the Dancing Pines Distillery’s tasting room where we got a chance to try some of their fine spirits. Dancing Pines started out distilling whiskeys and have expanded their selections. These include a number of artisanal spirits to include some fantastic liqueurs, one of which really caught our interest, the Brulee. The Brulee is a caramel liqueur that is made using corn spirits (moonshine) and real caramel made in an old copper candy pot from the Jelly Belly factory in Denver. The Brulee has a beautiful dark caramel color and it tastes just like a freshly torched creme brulee, the butter, cream and cane sugar used to make the caramel giving the liqueur a rich buttery caramel flavor. 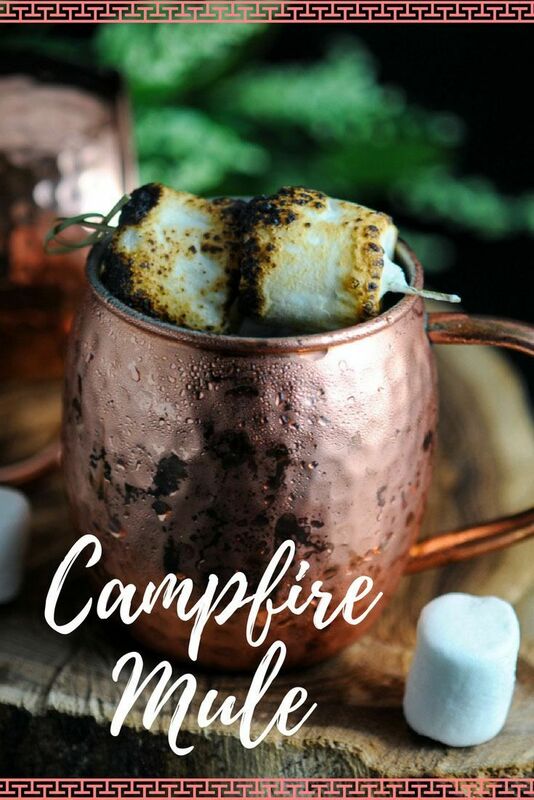 What Ingredients are Needed for the Campfire Mule Cocktail? When we were sampling the spirits, the Brulee immediately reminded both of us of one of our favorite campfire activities, roasting Sur La Table Snowflake Marshmallows by the campfire. This immediately got our brains thinking about how we could use some of the delicious fine spirits at home! 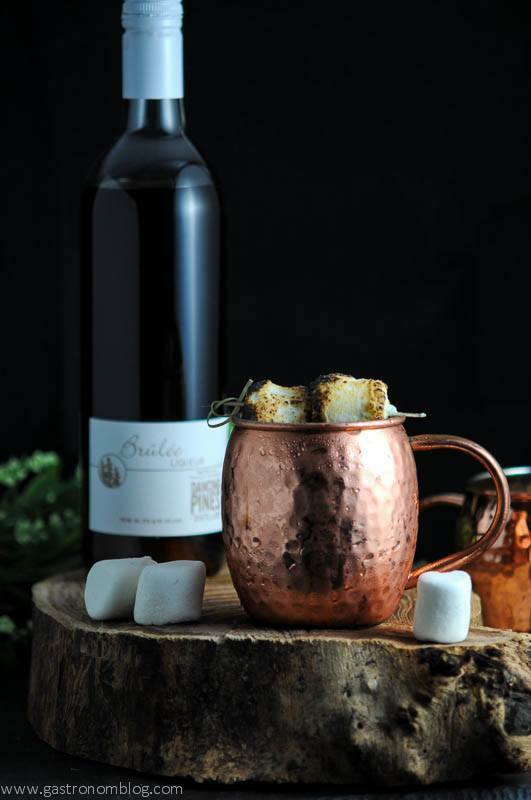 The Campfire Mule uses Dancing Pine Distillery’s Brulee liqueur to give the Campfire Mule that delicious burnt sugar flavor. You know the one that you get from toasting marshmallows over a campfire. 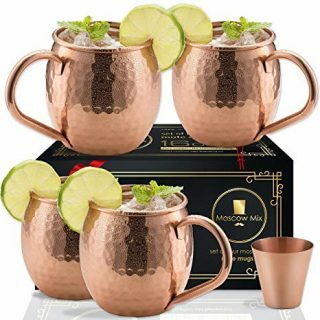 Starting out with the classic Moscow Mule recipe of vodka, lime and ginger beer, we substituted the Brulee liqueur for some of the vodka. We also trimmed the amount of lime down so that the toasted sugar flavors can come forward. 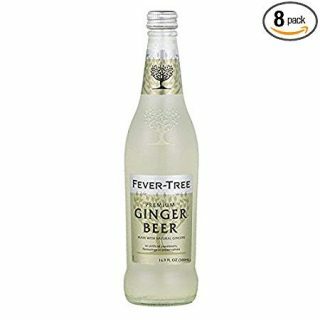 The crisp ginger beer gives a hint of a spicy bite and keeps the Campfire Mule from getting overly sweet while adding a bit of refreshing effervescent fizz. 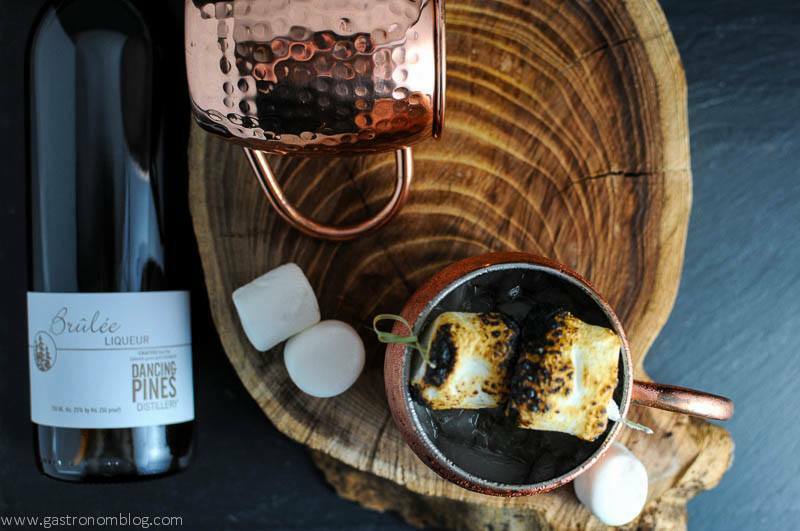 Toasted marshmallows are the ideal garnish, and gives a bit more toasted character to the Campfire Mule. Unlike some of our other mules like the Blueberry Cucumber Mule or our Caramel Apple Mule, this Mule is a bit more boozy. 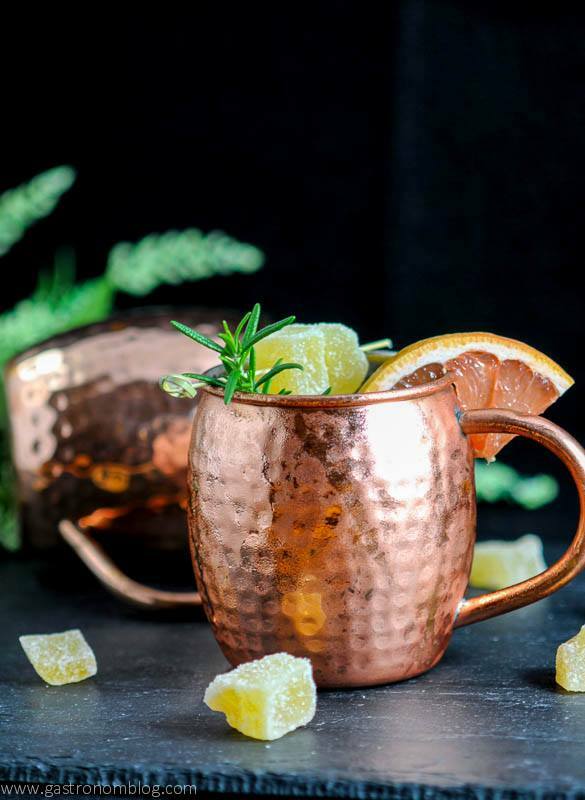 It gets its flavors from liqueurs rather than fresh fruit or flavored syrups, so the Campfire Mule can pack a real kick! 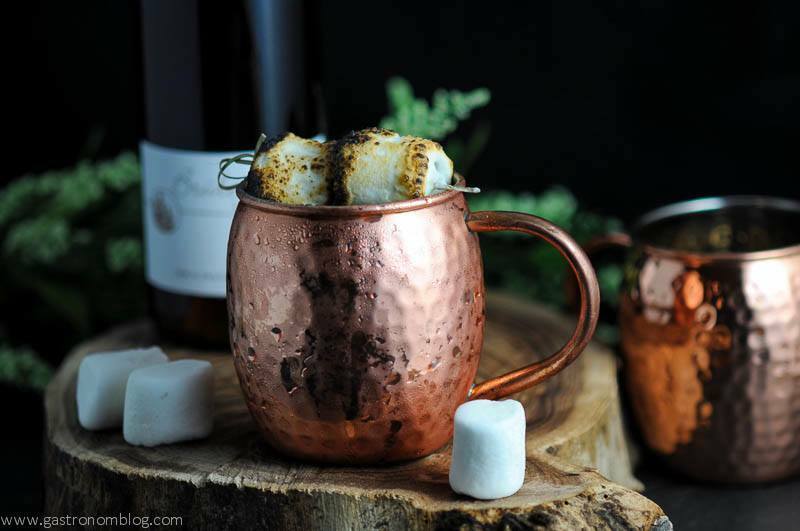 A smoky Moscow Mule that is sweet, and comes with a marshmallow! 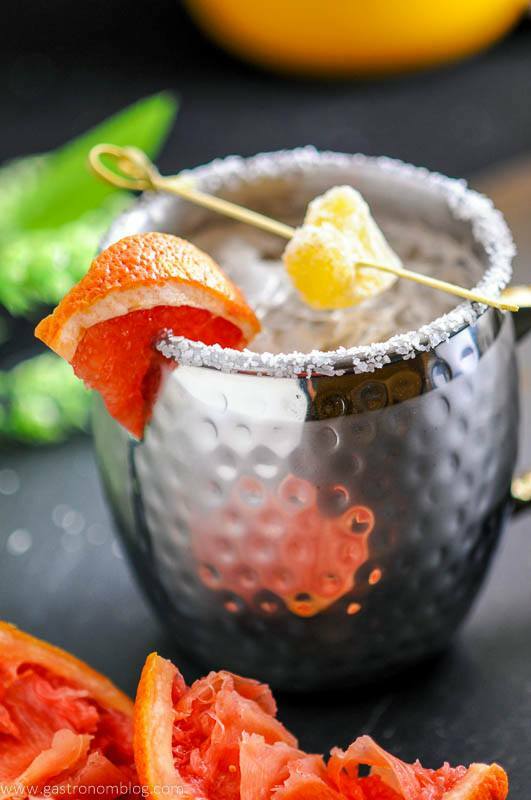 Combine Brulee liqueur, lime juice, vodka and ginger beer with ice in a copper mug. 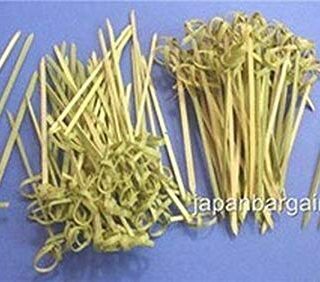 Stick marshmallows on to garnish pick. 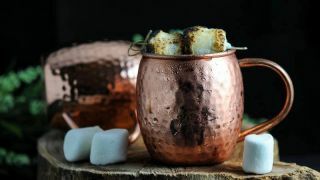 PIN THIS CAMPFIRE MULE COCKTAIL RECIPE FOR LATER! This sounds so delicious! I love finding new drinks to try! Oh my goodness, does this ever sound divine! Heck yeah! One of the most delicious cocktails. 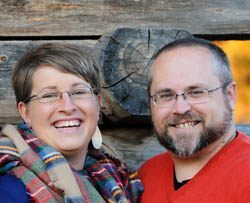 FYI: photos are amazing! Thanks so much, so appreciated! Cheers! I want to try this out RIGHT NOW. So perfect for summer! Thanks, we thought so! Cheers! Thanks so much! We thought it was perfect for the summer! Cheers! I NEED this cocktail in my life. It looks amazing! Aw, thanks much! We thought it was a winner! Cheers! I love moscow mules. This looks delicious. I will have to try it. Oh I’m gonna try this drink…. This look absolutely amazing! Must try this! Thanks! Hope you do, cheers!